Tonight we are going to vote whether we want to spend the largest portion of the cost to build the Music Center. Although it looks like we are fully committed because we have already spent $2.3 million on the land purchase and $2.4 million on preparing the site, it may be possible to recover most of that money if it turns out the Music Center concept is not feasible. However, after we get started on the building it will be impossible to make up for mistakes in planning. So I'm asking council to reflect on the wisdom of going forward when council hasn't demonstrated in public the feasibility of the project. Because the city has not provided any in-depth public discussion about the feasibility of the Music Center, I recently asked the city to provide the reports that council used to decide we will be able to pay off the debt associated with the Recreational Complex and the Music Center. I was provided two documents concerning the financing and the Validation Study. These documents although never made public as part of an official city meeting or discussion make me wonder if council members can make a responsible decision on whether we as a city should go forward with the Music Center. The document addressing the Aquatic Center had specific information about the specific pieces of property that would be generating the taxes to pay off the Aquatic Center debt. For instance it tells us to expect Wal-mart to pay $239,000 worth of tax until 2015 and then $101,000 in tax after that. The document for the music center does not show that type of detail and it doesn't give any indication how the tax numbers were created. The other big problem with the report the city gave me about the Music Center financing was it was still using data from Sept 2011 when the Recreational Complex computations were done. In that report they expected to finance up $6.8 million in 2011 at 4.5% interest. We know that they now intend to complete that financing in November of 2013, instead of $6.8 million they have $12.5 million of Recreational Complex debt to finance and we don't know the interest rate but we do know they have been climbing since April. On the bright side because they haven't been paying the debt the TIF money "on hand" is significantly higher than the $2 million they expected to start with in 2011. This should offset some of the problems caused by higher interest rates and almost twice the expected principle. However, without an updated report with real numbers it is impossible for council to know if we are on schedule to pay of the Aquatic Center and so it is impossible to make a responsible decision about the new debt for the Music Center. Specific concerns from the Music Center validation center include an expectation that the city will be able to hold 6 music festivals a year where we sell 30,000, $15,00 tickets. In the Validation Report it tells us planning for each successful event can take more than a year. I've not seen any public discussion that shows the planning for next year's event have begun. Looking at the Validation Plan we see they plan to bring the Cincinnati Symphony here 4 times a year to compete against the Dayton Philharmonic. 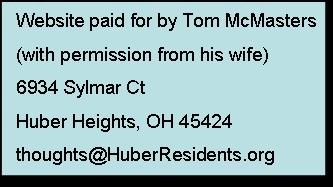 Last year the city brought the Dayton Philharmonic to Huber Heights and more than half the available 800 seats went empty. The Validation Study show the 6 festivals and 4 Local Events are suppose to bring in almost half the total number of people using the Music Center. The report tells us to succeed will take aggressive marketing and also shows us that they intend on doing this with less than $2000 of event marketing per Music Center event. In contrast when the city brought in the Dayton Philharmonic they authorized $6000 for marketing that event. The report tells us to hire a management company. Then it computes the cost of the Managing Director, Production & Operations Manager and 4 other positions as if they were going to be city employees. Cost to hire these same people using a private contractor could easily add $150,000 to the cost of managing the facility. 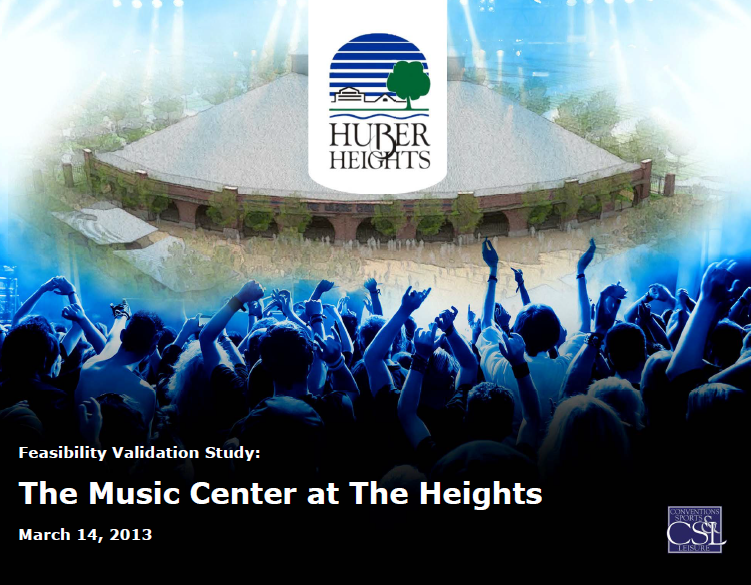 The Validation Study tells us the PNC Pavilion cost $6.5 million. We know the PNC didn't have to purchase property and they shared the cost of parking, restrooms and concession stands with Riverbend. Our facility also will have a better cosmetic appeal and a sound barrier between it and the highway. However, council has not taken the time to show the public how these differences add up to $12 million in additional cost. 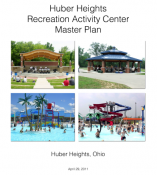 Tonight we are going to vote on whether we should spend the largest portion of the Music Center cost and the information provided to the residents of Huber Heights does not show the project is feasible. I ask each council member to reflect on the vote they are about to cast. If they are aware of information that mitigates these concerns I ask that they provide it in an open public meeting. It they are unaware I ask that they defer a yes vote until a proper assessment is completed. If you haven't done it at least read the Executive Summary of the full document prepare for the city. In this part toward the end I concentrated on cutting and pasting the Festival expectations. It shows the city expects to be able to put on 6 festivals a year where 5000 people buy tickets at $15 each (plus $1.50 parking fee) all while spending just $1000 each event on advertising and promotion. Here is part 2 of 2. Still to come thoughts and evaluation. I started a document to pull out interesting parts of the Music Center Validation Study.